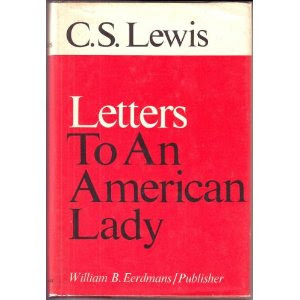 I really can't say that I understand why Letters to an American Lady exists. Originally published in 1967, this book contains a collection of letters that C.S. Lewis wrote to an anonymous lady in the United States. He began writing to her in 1950 and continued on until his death in 1963. He never had a thought that these letters would be published, although I suppose it's natural to assume that if you are a famous writer, people will be looking to read everything that you ever wrote. In my own non-scholarly opinion, Letters to an American Lady is a perfect argument for why we don't need to read every single thing any author ever penned. Some of it is just....non essential. But that's just my opinion. b.) They show the humanity of C.S. Lewis. ". . . these [letters reveal], perhaps more candidly than anywhere else, the kind of man and the kind of Christian that was C.S. Lewis." I find that statement incomprehensible, truth be told. He was kind of a candid fellow and unashamedly Christian by nature. His Christianity pervaded everything he ever did/wrote/said. I don't know why this book would be touted as being the most candid of all of his works. Just perhaps, reading that claim soured my opinion of the rest of the book. In the end, I have a rather harsh opinion of it and it has nothing to do with C.S. Lewis. He wrote letters to a lady in America having no thought or intention of ever having them published. In these letters he discusses health and this lady's financial sufferings. He comforts her fears and concerns and encourages her in her faith and sympathizes with her troubles. It's a pen-pal exchange and we don't get see what her letters to him were all about. In fact, I'm not sure that I would have found reading her letters any more helpful as he was obviously trying to sort out the facts of what she was saying to try to have a clear picture of what her spiritual difficulties and general every-day-life trials were. I closed this book having a rather snarky view of the Anonymous American Lady who wrote to C.S. Lewis constantly - always with a complaint about her personal life. I left with the impression that all she ever said was, "I'm sick! I'm tired! People hate me!" (Guess I should just go eat worms...?) She struck me as a lady who couldn't take a hint when he would tell her that she shouldn't expect to hear from him so often and/or should not expect long letters - particularly around the holiday season when he was buried in fan mail. Reading his letters to her, I got the feeling he had to constantly remind her not to expect so much from him and that he wasn't able to respond as she probably wished. I got the feeling that she wanted and expected too much from him. Even after he married she continually wrote to him, frequently and at length. He remarks in one of his letters that she is one of the few female correspondents that he has left, most having ceased writing to him after his marriage to Joy. I don't know. It just feels odd and bizarre to me that a single woman would pester C.S. Lewis so, expecting much of him and lodging her list of life's complaints on his doorstep. For all of that though, he seemed to generally respect her as a pen-pal and even arranged for his American publishing company to send her a small stipend of his profits every now and again to help support her when she was suffering financial troubles. He seemed to feel generally kindly towards her. At the same time, you read it thinking to yourself that he was trying to understand her, didn't completely, and so just did the best he could. "If I didn't have so many letters to answer, I'd have time to write another book." I have to wonder which would be better. Still, she no doubt appreciated his attentions and the letters in her mailbox. For her, that seemed a helpful balm of sorts which helped her to face life. Viewed in that light, you could say that this book showed Lewis's helpful ministry in the area of letter writing. (He responded to every single letter ever sent to him.) If that's the case, I have my example of him acting in this ministry and I'm certainly satisfied. Isn't it good to have perspective? Thanks for the insight. This was one of those "maybe, someday, if I ever get to it" books for me, but it was waaay down the list. This sounds like a pass for me. C.S. Lewis wasn't exactly an enigma, so I don't feel the need to get to know him better through this particular series of letters that he wrote. His stories do that pretty well for me. I don't think it would be fun to read only half the conversation. Thanks for posting this review as I don't think I'll bother with this book. Interesting. I think I would agree with your gut reactions. This is interesting in light of things I'm learning from 'The Narnian' about Lewis' correspondence. He really was amazingly faithful about answering fan mail, even though much of it was in a similar vein to the letters you describe here.